by Emily Davis. John Wiley & Sons, 2012. 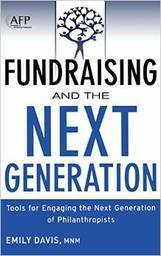 Fundraising consultant, Emily Davis, presents this thorough and helpful resource to aid congregations and other non-profits in understanding the differences between traditional fundraising and what must be done to reach a new generation. Her work discusses the importance of social media, leadership development and tactics to reach funders under 40 years of age. Included are a glossary of social media terms, a list of academic resources for development and professional advancement, and an assessment toolkit. Of particular interest are three chapters describing the relationship between philanthropy and volunteering, the necessity of making a case through story-telling, and the power of grant seeking for contemporary fundraising. A chapter on the impact and importance of social media is particularly insightful. The appendix includes powerful resources and checklists for users. There is also direction to a website which continues the conversation provided in the book. This would be a most helpful resource to any congregation seeking to engage a new generation of faithful givers.